Hello. Just to be short. I cant seem to find what units where send to what garage(5300s and 6000). Can Someone please give me what garages they were send to. Or I just can't get them. Originally (Sept. 1995) approx. 6000-6109 to 77, 6110-6219 K, 6220-6329 74. Got scrambled after that. K's went to FG when FG needed buses with preheaters. 5300s were originally, in approximate order 103, C, FG, A. That was while I wasn't here, and slipped my mind. I also believe the lower 6000s went from 77th to K. Eventually some of the upper 60xxs made their way to 103rd. There was a hiatus of a few months between the deliveries of 6000-6229 and 6230-6329. The last 100 began arriving, I believe, in April or May, 1996. 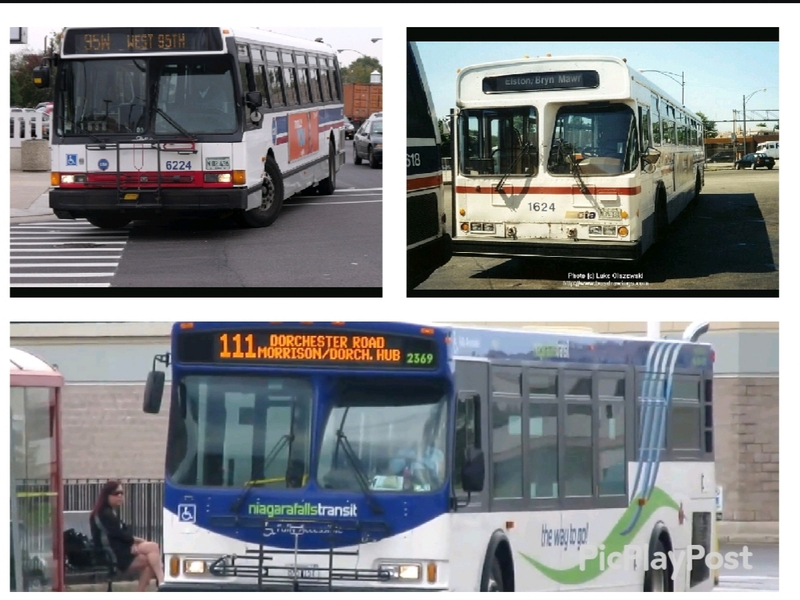 About 280 of the original 330 Flxible-Es were still operating when the CTA instituted system-wide service reductions in February, 2010. All 280 were retired and the Archer barn was shuttered. In their last days of service, they were distributed among four garages: K, FG, 103, & 74 --- if my memory serves me. Before the service cuts and the Archer garage closing you mentioned, all the remaining 6000s went either to F or 74th. At least F had 6400s as well, but 74th was all 6000s. When the 1000 series New Flyers came, 74th and F weren't slated to get any. However the high rate of breakdowns at 74th forced CTA to give 74th some New Flyers. Also, Archer at that time was all 6400 series Novas, which were split between A, C, and F.
You're right, Artthou; I remember the breakdown crisis at 74th. It resulted from a plan to assign each garage one make of bus, such as Archer being all Novas (as you stated.) 74th wound up with a full roster of 12-or-13-year-old 6000s (insane). Sometime in late 2008 or early '09, 74th received 1100s from both Kedzie and Chicago Avenue, in exchange for some of the 6000s. In my last post, I forgot to mention that C ended up with 6000s, in addition to K, FG, 103, and 74. 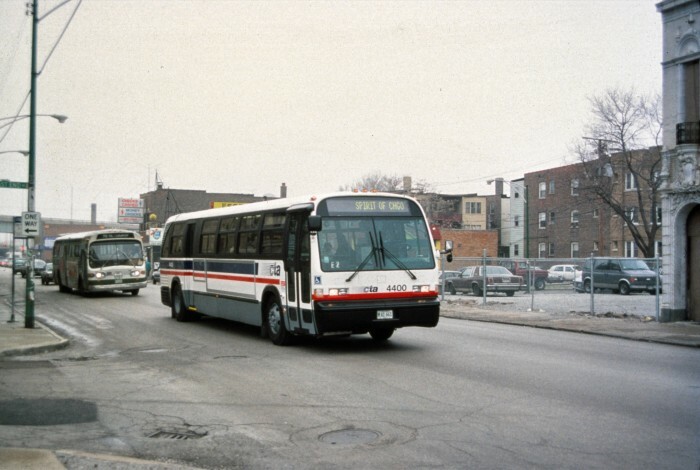 I don't know if that was part of the plan, but the 6000s didn't hit routes such as 9, 55, and 63 (at least they were not declared accessible) until 69th closed and 74 opened in Sept. 1995. Biggest problem with 6000's in their later years were the lift, which had a nasty habit of not stowing. Otherwise ran good until the final day. Last I heard there were still about a dozen derelict 6000's still at SS, some over a decade already. Legal holds. They still there? One retired 6000 was converted into a mobile communications unit for the CPD. It looked really spiffy in the CPD livery, and could often be seen at major events. I'm not sure if it's still in use. That was a retired 5300 unless cpd have 2 flixibles. I vaguely remember seeing an image of that 5300, too. But this one was a 6000, I'm reasonably sure. I remember the profile. Maybe there were/are two. This is definitely a 5300 series Flx. The size of the hopper windows and the slanted rear are dead giveaways. I remember these having lots of issues with their lifts later in their lives(not deploying or not retracting fully, causing the bus to be disabled). Never doubted the existence of a 5300 in the CPD fleet. The one I spotted, either in 2016 or '17, looked as if the interior might have been partitioned. I should have taken a picture. There was some kind of signage that indicated it was a mobile communications center. I could be wrong, but the one in the photo looks as if it's being used simply as a bus. Yeah I remember the lift issues that cropped up in their later years. I remember one on the 12 that the operator deployed to board a wheelchair at Western. That passenger was just making finishing paying his fare when what was apparently the lift's hydraulic fluid suddenly started gushing from the bottom of the bus. The lift was stuck in the up position that it was in to let the wheelchair roll into the bus. The bus had to be taken out of service obviously. I'm not sure how they got the wheelchair out though as I was transferring to a 49/X49 (this happened at about the time K was starting to get its second allotment of New Flyers and still had 6000s that hadn't yet been pushed to FG, 74 or 103) at the time. From my memories. The 5300,6000 and 4400's had notorious wheelchair lift issues. You are right - a lowfloor has a flipramp that can be opened and closed manually if motor fails. No more "lift problems!" Since we're talking about Flxibles I thought of these Orion buses which to me look like the Flxibles. I really wish none of these manufacturers went out of business cause the 6000's are my favorite cta bus and I wish I had the chance to drive them but time I started they were 2yrs retired already smh lol. But just imagine these buses in cta colors. I really wish they would've ordered these. Is it any particular name for this type of design? Like you have the fishbowl look for example. But what was this look called?? 1624 is a Flyer D901A not a Orion. And Flyer was renamed to New Flyer. Sure the orions do look like the flxible metros but it will be the Orion Vs If you ask me. I definitely know the difference between each bus. I was referring to the style of design as far as how they all share that window design. I was asking was it a particular name for that design or type of front end that these 3 different brands of buses share. For instance we all know what the fish bowl bus is based on how it looks but I wanted to know what's the name of this style of bus or if there's a name for it at all. If you're talking about the slanted driver's window, i always thought that was to reduce glare. The designs are similar, which I think was just a sign of the times. Compared to today's standard of everything being rounded/curved.